Userlytics Review: Make Money Testing Websites! 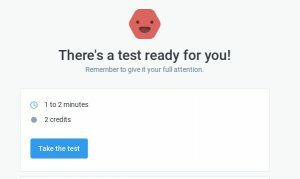 Last updated on February 14, 2019 By Nat Leave a Comment This post may contain affiliate links. We appreciate you supporting Rags To Niches! Full disclosure here. uTest Review – Is uTest Legit? Last updated on February 1, 2019 By Nat Leave a Comment This post may contain affiliate links. We appreciate you supporting Rags To Niches! Full disclosure here. UsabilityHub Review: Legit Easy Cash? Last updated on September 17, 2018 By Nat Leave a Comment This post may contain affiliate links. We appreciate you supporting Rags To Niches! Full disclosure here. Filed Under: positive reviews, Usability Testing Tagged With: Is UsabilityHub a scam, Is UsabilityHub legit? USERBRAIN Review: What Is It And Is It Worth Your Time? Last updated on October 14, 2018 By Nat Leave a Comment This post may contain affiliate links. We appreciate you supporting Rags To Niches! Full disclosure here. 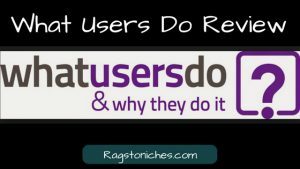 What Users Do Review: Earn Cash For Feedback? Last updated on January 15, 2019 By Nat 2 Comments This post may contain affiliate links. We appreciate you supporting Rags To Niches! Full disclosure here.